Crispy, Baked Chicken Chimichangas! 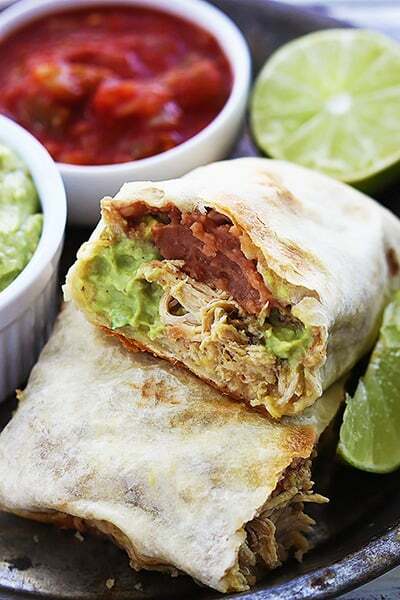 These burritos are so yummy and healthy because they’re baked instead of fried! Did you have a fantastic Christmas?? And if you don’t celebrate Christmas, did you have a fantastic Thursday?? Either way, I hope it was wonderful and filled with lots of cookies. My mantra this week: Cookies are always a good idea. At our house, the holidays are always jam-packed with heavy, “flat” foods. I call them flat because they really aren’t bland, they always have lots of flavor, but the flavors all kind of blend into one another if you know what I mean – no climax. So after a triple-helping of ham and mashed potatoes, I always crave something with a lot of kick and for me, that always means Mexican food. Then again, I quite literally crave Mexican food every. day. of. my. life. So…. I guess I use the holidays as an excuse to eat tacos and guacamole for 17 days in a row and not feel weird about it. This week I made chicken chimichangas – ohhhh yeahhhhhh – and since it’s almost January (how. how is it almost January already.) are over and everyone (um, mostly meaning ME.) is thinking about how they should probably make some healthier eating decisions to get “back on track” after the holiday deviation, I made baked chicken chimichangas. So much easier and healthier than fried ones and you will not miss the oil, I promise you. 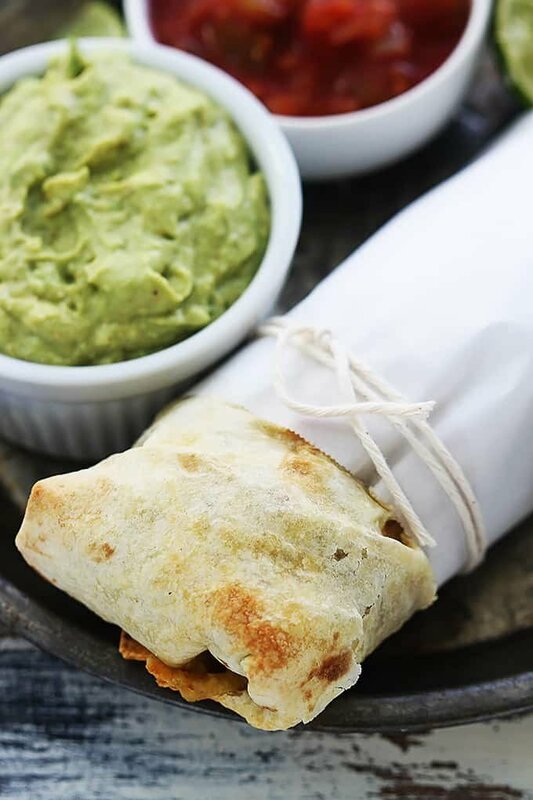 These still get plenty crispy in the oven and they are full of yummy things – hello cheese, Mexi-chicken, guac, and re-fried bean goodness. If this is what getting back on track looks like, count me IN. 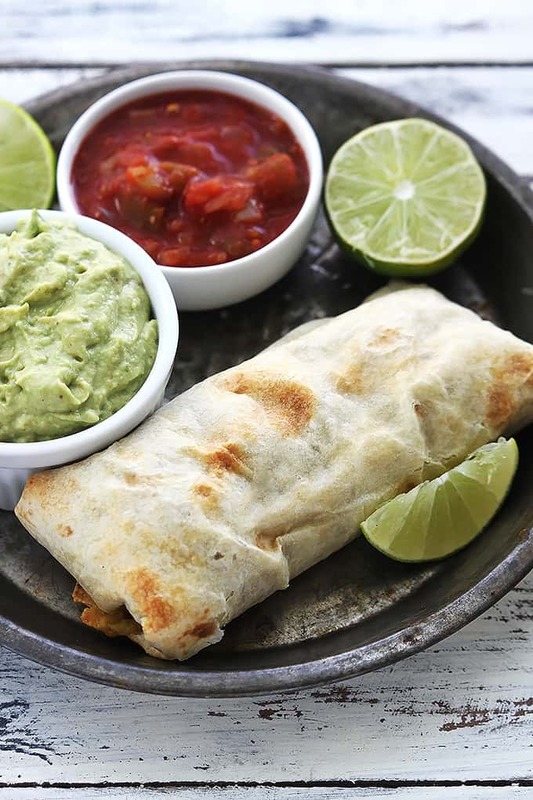 Crispy chicken chimichanga burritos! These are so yummy and healthy because they're baked instead of fried! Preheat oven to 425 and grease a baking sheet. Lay your tortillas out on a flat surface. Spread refried beans in the middle of each tortilla. Spread guacamole on top of the beans. Add shredded chicken, then shredded cheese. Roll into a burrito. 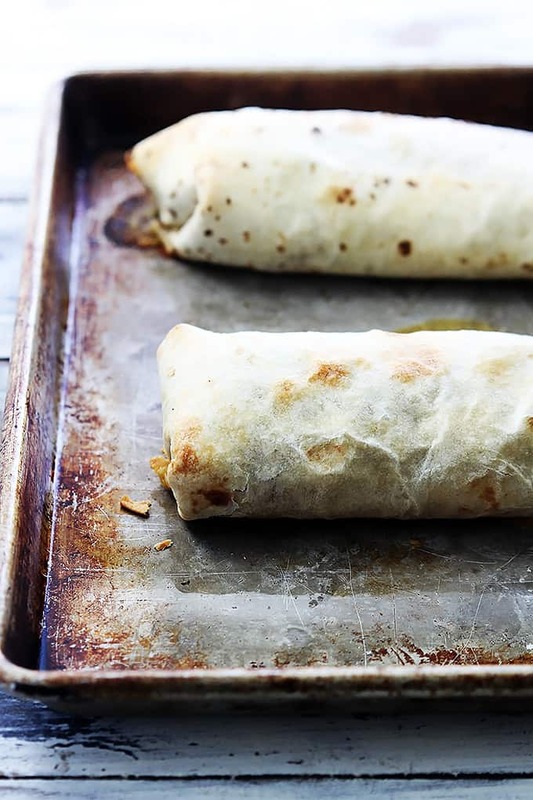 Place burritos on prepared baking sheet. Spray generously with cooking spray, OR brush with oil. Bake for 15-20 minutes until the tortillas are browned and crispy. Serve warm with additional guacamole and salsa if desired. Add all ingredients to slow cooker. Cover and cook on high for 2-3 hours or on low 3-4 hours. Take the lid off the slow cooker, shred the chicken with two forks. Give it a stir and let it sit in the juices for about 10-15 minutes before serving or using for other purpose. Love that you baked these. Makes the entire process so much easier than heating up oil, cleaning up oil, waiting for oil to cool, etc. My meat-loving boyfriend will love these! These look fantastic! How do you think they’d go if you froze them? I think that’s a great idea! I’d prep them to the point just before baking. Then probably freeze them in sealed plastic bags. They’ll require a little more baking time if you cook them from frozen, but about the same if you let them thaw first. I am wanting to make easy-to-reheat meals for my boyfriend who works midnights. Do you think these would freeze and reheat easily? Found this recipe on Pinterest and gave it a go tonight. I kept the guac on the side but put jalapenos inside as well as black bean + corn salsa. FANTASTIC! The chicken was plenty flavorful without the preservatives in packaged seasoning. THANK YOU!! Any idea on the calorie count on these? Hi Traci – I don’t have the count on hand but I love using http://www.myfitnesspal.com to calculate nutrition when I need to! Love it. The bf and I do mexican at least once or twice a week. After getting home from grocery shopping with chicken done in the slow cooker, realized I didn’t have refried beans at home. Threw some kidney beans in the food processor and cooked them up with some taco seasoning and Jalapenos for the bean part of the filing. So good. Next time I’ll try with refried beans but it still turned out great! Thanks for posting! Ooh, good thinking on the kidney beans – nice save! These are a great go-to, we love them! And I’m totally with you on Mexican nights each week – it takes a lot of self control for me not to do Mexican EVERY night. I love this recipe!! I can make it lower in calorie by using fat free refried beans and low fat cheese. These will be a terrific lunch alternative. Thanks for sharing! Genius ideas for making it even healthier! Has anyone tried them cold for lunch? If so what did you think? Desperate for lunch alternatives and the suggestion of making freezing and then baking would mean we could just pop them in the oven while making dinner the night before. I made these for my family tonight and everybody loved them! That is not an easy feat with my picky kids. This will be a new favorite in our house! Very excited to try these, just put the chicken in my crock pot! I call him Rico Sauve and I love him! I try just about anything that uses him and make my life easier!!!! 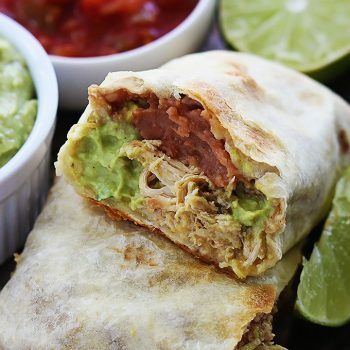 We do a baked burrito similar to this so I think it will be a huge hit!! For the record you are not alone in your need for Mexican food by Christmas. In fact we have a tradition for our dinner, yeah Christmas Nachos-it’s what’s for dinner people!!!! If we are actually leaving the house for dinner we take it w/us and assemble at the house of whom ever is hosting. My poor SIL worked so hard on a dinner, we warned her that there would be an uprising if our kids didn’t get their official Christmas Nachos so we brought them. Yeah everyone raved about our Nachos and not really her fancy roast. I felt horrible but I had a belly full of Nachos so life was good!!!! May I include a link and photo in a recipe round up this week? these are about to go in the oven. I made my own guac, but i cheated with store bought salsa, pre shredded mexi cheese and a cooked rotisserie chicken shredded and spiced up to make this in less than 40 minutes beginning to out of the oven!